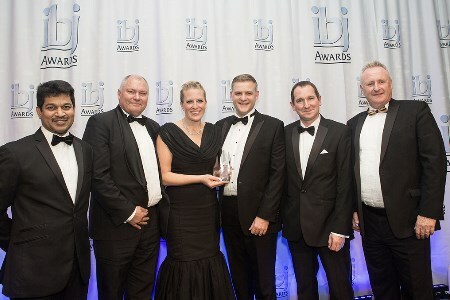 Siwertell, part of Cargotec, has won its fifth prestigious International Bulk Journal (IBJ) Award. A joint submission with its customer Peel Ports took the prize in the Best Ship Loading/Unloading System category at the awards ceremony held in London on 21 November 2016. "This latest win sends a clear message to anyone in the market for a dry bulk handling system that Siwertell is the first-choice for anyone whose priorities are capacity, safety, environmental issues and overall performance," says Emily Brækhus Cueva, Marketing Manager, Siwertell. The IBJ judges offered their congratulations to Siwertell and Peel Ports, noting that Peel Ports' new £100 million biomass terminal at the Port of Liverpool - constructed using two fully-enclosed Siwertell 790-D screw-type ship unloaders - greatly increases berth capacity, enabling quick vessel turnaround and vastly reducing dust emissions. The terminal is capable of supplying Drax power station with up to 10 train loads of wood pellets per day. Drax power station represents the largest single decarbonisation project in Europe; it will use up to three million tonnes of US-produced wood pellets a year. "We were honoured when Peel Ports asked us to partner with them in this award submission. We have immense faith in the quality and attributes of our products and take great satisfaction from ensuring that they achieve long working lives for their owners" says Juha Huovilainen, Sales Director, Siwertell. Peel Ports Group and Siwertell have a well-established relationship, with Peel Ports choosing Siwertell 11 years ago to design, manufacture, deliver and install a similar Siwertell 790D at its Liverpool Grain Terminal, the UK's largest grain import facility handling over 1 million tpy. The IBJ Awards competition was introduced in 2009 and this year it attracted a record number of entries. Ms Brækhus Cueva explained the awards' importance to Siwertell and their influence on the world of shipping, bulk handling and port operations. "IBJ is a well-respected organisation within the bulk material industry. Those in positions of responsibility take careful note of the shortlists and winners in categories relevant to their operations. They are also well aware of our regular successes, confirming our consistent performance and providing important industry recognition of our efforts and achievements".